ALIVE… WITHOUT A BODY… FED BY AN UNSPEAKABLE HORROR FROM HELL! Dr. Bill Cortner is a surgeon like his father. After reviving a patient using experimental techniques, his father is nervous. “Don’t try to play God,” he warns him. But, Dr. Cortner obviously isn’t listening. He is obsessed with performing surgical transplants and continues to experiment with amputated limbs he steals from the local hospital. While driving to his secret mountain laboratory to tend to an emergency, Cortner’s recklessness causes an accident and his car careens off the road, killing his fiancée. Not one to pass up the opportunity, Cortner steals her decapitated head from the burning wreckage and tries to keep it alive long enough to find a suitable body to re-attach it to. As the doctor stalks women and searches for a new body, Jan’s decapitated head stays alive in a tray– telepathically communicating with something locked away in the lab closet– plotting her revenge on the doctor for not letting her die in peace. Previous home video versions of this classic film were all butchered television prints. 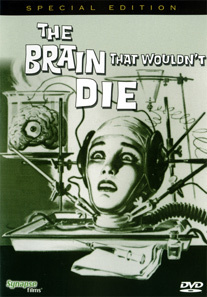 Synapse Films is proud to present THE BRAIN THAT WOULDN’T DIE in its original uncut form, containing all of the extra gory footage! An obvious inspiration for such films as RE-ANIMATOR and even Steve Martin’s THE MAN WITH TWO BRAINS, THE BRAIN THAT WOULDN’T DIE is classic cult entertainment and a treat for all horror film fans!